Have a forgotten favorite sitting in your closet? We all have that piece that’s hiding in the shadows and tucked into the back of our closets. It’s not that we don’t love this piece — it’s gorgeous after all — it’s just been forgotten. When we happen to push today’s go-to pieces aside as we dig for a summer clutch or pair of sandals, we’re delighted to rediscover our old pals. 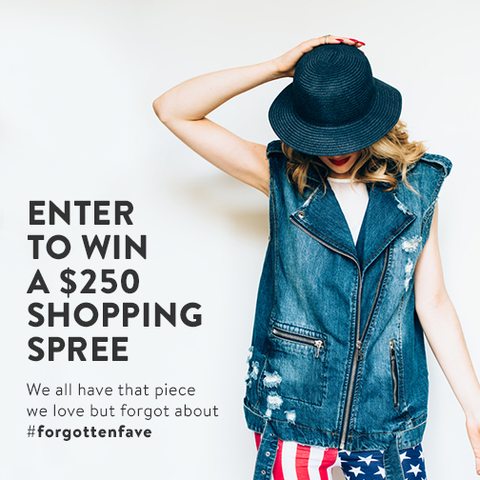 Want to reunite with your #forgottenfave and win a $250 shopping spree on thredUP? Enter the contest by snapping a photo of yourself modeling your #forgottenfave and share it on Instagram, Facebook or Twitter. Tag #forgottenfave and @thredup for the chance to win a $250 thredUP shopping spree! (Note: if you’re sharing on Instagram please make sure your account is public so we can see the photo). You have until July 11th to enter. So go on, explore that closet of yours and see what you can find!